Oprah Winfrey, Harry Potter author JK Rowling holding her book Harry Potter and the Deathly Hallows and Movie legend Walt Disney with his cartoon creation Mickey Mouse. Just recently there have been a lot of people who have tragically taken their own lives because they seemingly felt that they had failed. Failure is a very personal thing and it can consume you to a point where you start to get depressed and go into a downward spiral. In reality your problems are usually not as bad as you may think. This week I will introduce you to three famous people who have failed many times before succeeding in their personal goals. Hopefully this can serve as some sort of inspiration for people across our region. Oprah had a rocky start in life. As the daughter of a teenage low-income mother, Oprah’s living conditions were rough and she was sexually abused, starting at the age of nine by her cousin then uncle and finally by a family friend. At the age of 14 Oprah got pregnant but her son died shortly after birth. Oprah was then sent to live with her father, Vernon, in Tennessee. He helped her focus on her schooling and she was subsequently accepted on a full scholarship to the University of Tennessee, majoring in communications. In high school Oprah interned at a local radio station, helping to develop a foundation for a career in the media. Even after Oprah was hired by a local television station for the news, things didn’t go so easily. She was fired by the producer because she was ‘unfit for television’. Later, in 1983, she relocated to Chicago, to host a station’s low-rated talk show called AM Chicago. Within a few months, the show went from last in the ratings, to the Number One show at that time. This led to the show being renamed The Oprah Winfrey Show and the rest is history. Rowling is one of the most inspirational success stories of our time. 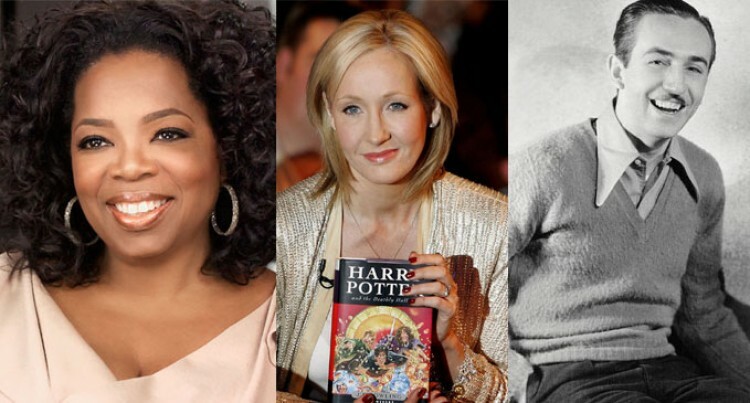 Many people simply know her as the woman who created Harry Potter, but what most people don’t know is the tremendous struggle she went through prior to reaching stardom. In 1990, Rowling first had the idea for Harry Potter. She stated that the idea came ‘fully formed’ into her mind one day while she was on a train from Manchester to London. She began writing furiously. However, later that year, her mother died after 10 years of complications from multiple sclerosis. In 1992 she moved to Portugal to teach English where she met a man, got married, and had a daughter. In 1993, her marriage ended in divorce and she moved to Edinburgh, Scotland to be closer to her sister. At that time, she had three chapters of Harry Potter in her suitcase. Rowling saw herself as a failure at this time. She was jobless, divorced, penniless, and with a dependent child. She suffered through bouts of depression, eventually signing up for government-assisted welfare. It was a difficult time in her life, but she pushed through the failures. In 1995 all 12 major publishers rejected the Harry Potter script. But, it was a year later when a small publishing house, Bloomsbury, accepted it and extended a very small £1500 advance. In 1997, the book was published with only 1000 copies, 500 of which were distributed to libraries. In 1997 and 1998, the book won awards from Nestle Smarties Book Prize and the British Book Award for Children’s Book of the Year. Today, Rowling has sold more than 400 million copies of her books, is a billionaire and is considered to be one of the most successful woman authors in history. The man who has affected generations to come with his cartoon creations, was once considered a failure. Disney was fired by his editor in 1919 from his job at the Kansas City Star paper because he ‘lacked imagination and had no good ideas.’ However, the man who brought us Mickey Mouse and a slew of other characters didn’t stop failing there. Disney’s first go at business landed in bankruptcy when he acquired an animation studio by the name of Laugh-O-Gram. The company was acquired because at the time Disney’s cartoon creations had gained popularity in the Kansas City area, but when he hired on salaried employees, he was unable to manage money and the business wound up heavily in debt. Subsequently, he filed for bankruptcy and moved to Hollywood, California. Anyone that has to suffer through the torment of failure and bankruptcy knows how this feels. However, it also laid the foundation for a successful career. When he formed the Walt Disney Company, all of his past failures helped to pave the way for a successful business. Disney and the Walt Disney Company have touched the lives of millions across the globe. From cartoons, to theme parks, and animated movies, both children and adults now enjoy the fruits of Disney’s labour. Had he given up, things would have been far different, but he persevered and that was the key to his success.